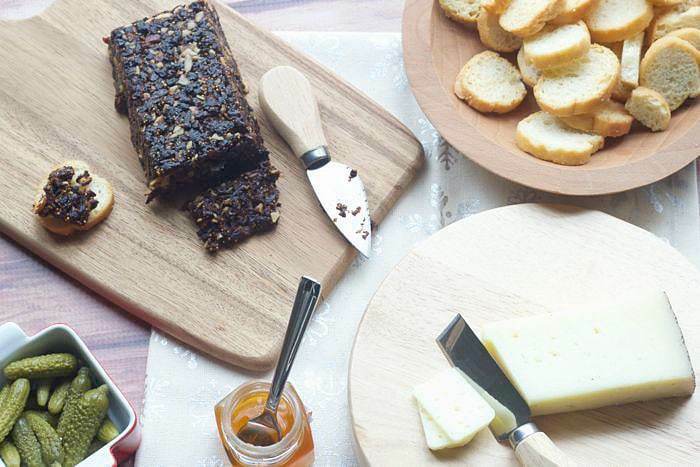 Pan de higo, Spanish fig cake, is a wonderful addition to your cocktail party cheese plate. Plus, enter to win a food processor thanks to sponsor Hamilton Beach! Whenever my friends and I get together, we make sure to stock up items for the cheese plate. A day of working? Cheese plate. A day of baking? Cheese plate. Heading to a restaurant? Yep, we’ll probably order the cheese plate. Of course, since I come from Wisconsin, this sort of behavior should be expected. And really, can you blame me? There’s so many different kinds of cheeses, and so many things to pair them with, that it’s hard to get tired of the cheese plate. My latest addition/obsession is pan de higo, Spanish fig cake. It’s not cake in the traditional sense, but it’s typically formed into a sliceable round or loaf perfect for noshing. The simplicity of the recipe helps the flavors stand out next to cheeses like Manchego, and can be enjoyed alone or atop crostini. It’s a great gift option too, because fig cake is made ahead of time and allowed to rest so the flavors meld, so you can do a batch in small lined baking pans or rolled into cylinders to give out. Pan de higo comes together quickly, especially with the assistance of a food processor. I recently had the opportunity to test out the Hamilton Beach Stack and Snap 10 Cup Food Processor, and I’m glad I did. You see, I’ve had an expensive top-line food processor for a few years, and I avoid using it because it has too many attachments, too many bowls, and makes too much of a mess. Plus it’s extremely heavy, making it a chore to pull out and use. Happily, the Stack and Snap solves all of those problems for me. It’s lightweight, but still powerful, making quick work of the figs and almonds in this recipe, and kept every bit of flour contained inside the bowl when I mixed up our Thanksgiving pie crust. The 10-cup size is actually perfect for me, and I don’t have to worry about where to store all the extra tools — there’s just a couple extra blades for shredding and slicing, and those fit easily in my kitchen drawers. I’ve sent my old processor packing and now you can too! Thanks to Hamilton Beach, I have one Stack and Snap 10 Cup Food Processor to give to a lucky reader, just in time for the holidays! Enter via the Rafflecopter widget below, and then grab the recipe for the fig cake. You’ll love it for your holiday parties! Pour figs and almonds into food processor and pulse together until well chopped. Add cinnamon, anise, rum, and 1 tablespoon honey, and pulse until mixture starts to come together. Stir in final tablespoon honey, if needed. The mixture should be sticky and hold together well. Press mixture into wax-paper lined baking pans or wrap into a cylinder. If using pans, place waxed paper or parchment on top and weigh down, using canned tomatoes or another heavy item. Let rest for at least three days before eating. Will keep at room temperature for months. Disclaimer: I received a food processor for the purpose of review. I was not otherwise compensated and all opinions are my own. Reading your blog? Cheese plate! Planning my holiday baking menu? Cheese plate! I love cheese. RIght now my favorite is brie with fruit preserves. Hmm tough question! I looooved stracchino cheese in Italy! So so good on some crispy bread. My favorite (so far) is a deeply sharp cheddar. this is such a yummy post! Favorite cheese? I can’t pick just one! You mentioned manchego above and instantly I thought “I haven’t had that for awhile -better grab some!’ I love fresh ricotta. And ricotta salata (maybe even more than feta?!?) I can’t imagine our weekly fritatta without crumbled cojita making an appearance. I love a plain-jane crackers with any kind of mooshy-bleu. I make stuffed eggplants a couple times a month as an excuse to grab smoked mozzarella. I love sharp and assertive cheddars from across the pond. Creamy havarti, melty-gooey-fantastic-fontina (also great in fritattas! ), I love them all. I spend more time at the cheese counters than @ the meat counter while grocery shippping by a long shot. @Nic Thanks so much! Stuffed eggplant with smoked mozz sounds amazing; I’ll have to try it next time eggplants are in season. I love the intense flavout of blue cheese! I love a good sturdy Manchego. Thank you for the giveaway! Definitely manchego with drunken goat cheese right behind it. My favorite cheese? Is all of them a valid answer? I think for the time being I will answer with a mild blue that is good for snacking on. Thanks?